UFC president Dana White confirmed on Wednesday newly minted heavyweight champ Cain Velasquez has an injured shoulder and will be riding the pine for six to eight months. “Yep, it’s true,” White told with MMAFighting following today’s UFC 125 pre-fight press conference. 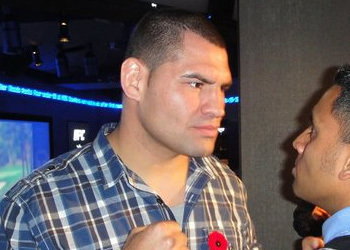 Velasquez posted four minutes and 12 seconds of perfection against Brock Lesnar at UFC 121 to capture the belt. The Mexican-American owns a perfect 9-0 record and has finished all but one of his victims before the final horn. According to Josh Gross of ESPN, Velasquez has a torn rotator cuff. The 265-pound king suffered the injury during the Lesnar scrap this past October. Team Cain are currently seeking 2nd & 3rd opinions regarding surgery. White was visibly bummed when confirming the news, but was hopeful for a summer of 2011 return. Junior dos Santos has next dibs at the title and will likely sit the bench until the champion comes back.Why not? Rashad Evans is doing it.